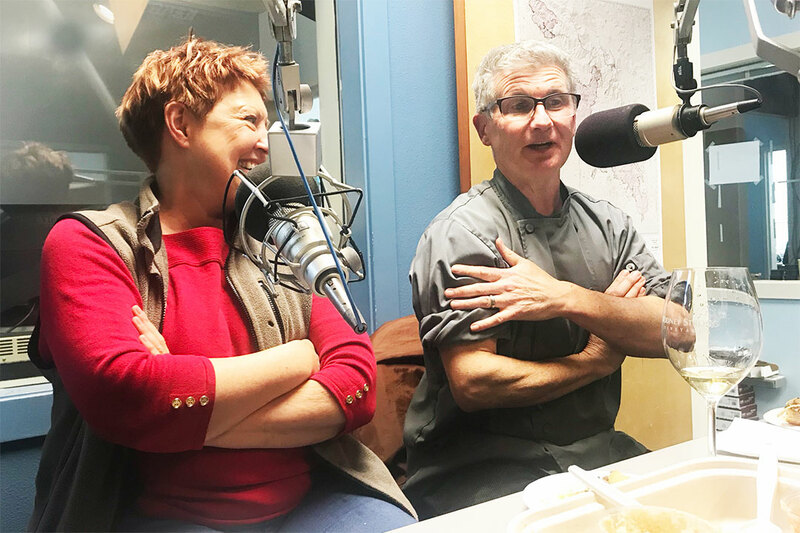 Gesine and John Franchetti from Franchetti’s Wood Fire Kitchen are our guests on California Wine Country with Steve Jaxon and Dan Berger. Everyone has brought some wines to taste and for pairings with some of the food that they have brought from their restaurant. Dan explains that there is great food in Sonoma County, in an atmosphere that is not fancy but is more focussed on the quality and variety of food and pairings with great wines. Franchetti’s wine selection is always changing and served with really interesting food. Gesine points out that their varied wine list allows for numerous food pairings. From Franchetti’s Wood Fired Kitchen, they are tasting some Lamb roasted with Harissa (a Moroccan red chile pepper paste) but it’s not very spicy, just flavorful. It gets charred in the wood-fired pizza oven. They also have brought some Arancini, which are Sicilian rice balls, and some Bruschetta. “Our food is really wine-friendly. everything you are going to drink on our wine list or at home, will pair well. This is how our food is designed,” says Gesine. First they open the Helderberg 2014 Sauvignon Blanc that Dan brought. It has a lot of lime and grapefruit flavors. Compared to New Zealand’s production, the intensity of the varietal character is stronger. The New Zealand ones are for drinking now, others are for cellaring. Barry brought a Grillo, which is a Sicilian white, produced by Tami’ label of the Occhipinti (pronounced “ok-y-PEENT-y” in Italian) family, who are leaders in the natural wine movement in Sicily. Steve asks Gesine to tell her story, and we hear that she took a job as an au pair in Anchorage, so she could learn the language, and that is where she and John met. He had gone to Alaska as a pilot and a chef. Gesine explains that their wine program is all about recognition, as people need to recognize the wine. That is why they carry labels and names that people recognize, such as Pellegrini, Trecini, Kokomo, etc. Now they are adding more new Italian and German wines, including a new German Riesling which is very tasty. John was named best chef in Anchorage, Alaska, two years in a row. He got to Alaska working as a chef in a fishing lodge, then worked with Gesine and developed their own restaurant. Then he left Sonoma County to go to New Orlenas, between ’86 and ’94, working for Emeril Lagasse. He sent him to Johnson and Wales, a culinary school in Rhode Island. In 1994 he told Emeril he was going to Alaska. They then taste the 2014 Nik Weis St. Urbans-Hof Wiltinger, which Dan finds appealing, for how dry it is after a soft entry. Next, the they taste a German Riesling, which is a dry one. Dan says there is a trace of sweetness in the entry, so it’s an “all-purpose” wine. Gesine says they just started adding German dishes to their menu. She wanted to honor her late mother, they did a promotion, in January, they called it “Germanuary,” and they sold more schnitzel than ever! John had cooked a lot with her mother so he knew how to do it. On one trip to Germany he tried it in many ways. It’s a breaded pork cutlet, and in many other places it’s done with veal. In Italy it’s known as Milanese veal, Wiener Schnitzel in Austria, or a Breaded Pork Cutlet in the US. They added sauce, which is unorthodox to serve with the breaded cutlet, but people love it so they do it. They also did a Fat Tuesday menu with creole recipes. After the break they taste a 2014 Laurel Glen Counterpoint Cabernet Sauvignon. Dan says it has good acidity and structure, and is very dark red. Dan says Cabernet Sauvignon grows very well on Sonoma Mountain, above the fog line. Dan says it would be best 6-10 years from the vintage, but that this could be drunk early. It’s available in many places by the glass. During the October 2017 Sonoma County fires, Gesine and John were busy feeding people and taking care of their neighbors. They could not open as a restaurant, they had no gas but they could roast things in their wood-fired pizza oven. Working with Heather Irwin, they became a central place where people could come pick up food. They opened up their doors to anyone and everyone on Thanksgiving and got a lot of help from others. Currently they are still feeding about 50 families, they do about 400 meals a week with another chef also named Heather. They distribute them on Mondays, 4 meals a week for 50 families. Dan’s annual wine competition in May holds the judges’ reception at Franchetti’s every year and they will again this year. The next tasting, back to Italy, a Super-Tuscan Blend, Ruffino Modus, made with Cabernet, Sangiovese and a little Merlot. It sells for $18.99 at Bottle Barn. It’s really tasty, a little bit of new oak but has the spiciness of old world Sangiovese. Dan says it has an earthy character. He explains that the Italians like to make their wines really dry. The Merlot in the blend reduces the tannins in it. Gesine says they have a Super Tuscan in the restaurant too. She says it takes a while for the wine to open up but it’s worth waiting for. They describe their success during Restaurant Week last week. They did lunch, brunch and dinner. Their lunch menu was Crab Louie, Arancini and a triple chocolate brownie for $15. They also did 3 different styles of eggs benedict with arancini and brownies, $15. They also did a Caprese with buffalo mozzarella with Kelly Parson’s tomatoes. She is a local farmer who grows hot house tomatoes so she has great tomatoes out of the normal season. At Franchetti’s they’re now gearing up for a Corned Beef and Cabbage menu for St. Patrick’s Day. 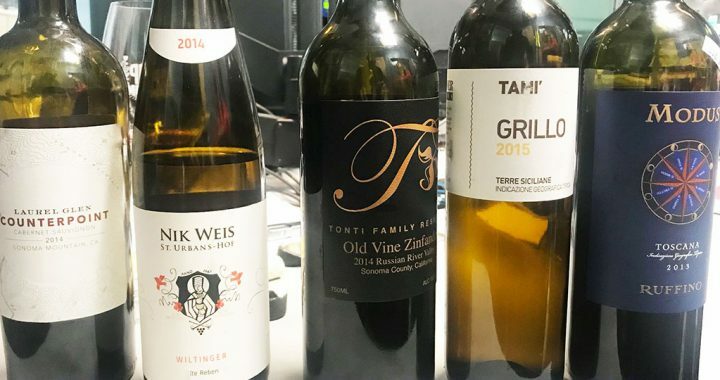 Asked what wine to pair with that traditional favorite, Dan suggests a Beaujolais style Zinfandel, as the lower alcohol style Zins work great with corned beef (which needs to be made the day before it’s served). An “alternative spirit” for this is a kind of whisky made with wine, which Franchetti’s carries. They also serve wood-fired pizzas, which can be paired with many different wines, depending on what’s on the pizza.